My favourite soup used to be potato and leek hence this one was a must for me to make. Cauliflower is such a great vegetable. It is especially good in soup for thickening and giving an almost creamy consistency-much like potato. As cauliflower contains more than 70% our daily recommended dose of Vitamin C, it’s perfect for winter. 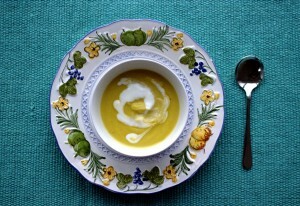 Forget your multivitamin, just make this soup :). This soup is also not too time-consuming. The whole thing should be ready in less than half an hour. YAY for super quick and nutritious recipes. This goes great with my almond flour crackers or just on its’ own is good too. A deliciously, warming winter soup packed with essential nutrients. 3 1/2 cups (800ml) Chicken stock* *Homemade is best or at least without any additives. 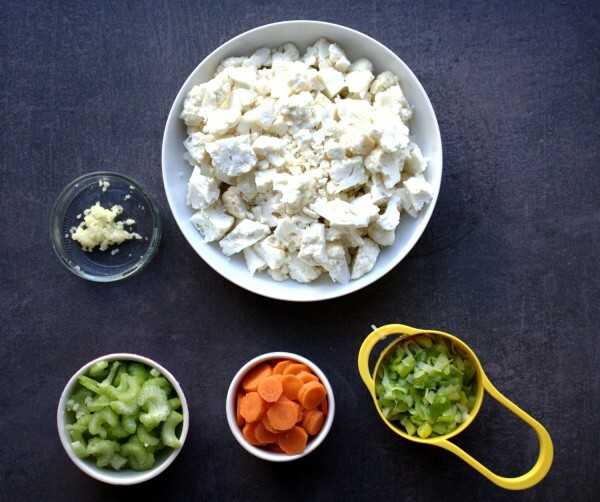 Melt butter/olive oil in a frying pan on a medium-low hear and add the carrots, celery and garlic. Sauté for about 5 minutes and keep stirring to prevent them from sticking to the pan. Add in the leeks and allow them to become fragrant. Sauté for a further 5 minutes. Transfer to a large pot at this stage and add the cauliflower. Pour over the stock. You should just be able to cover the vegetables. Season well with salt and pepper. Bring the stock to the boil before turning down to a low heat. Cook on a low heat, covered, for 20 minutes. Transfer the mixture to a blender and mix well. Serve with yoghurt (optional).